It was hard to resist the temptation to record once more in such a beautiful and interesting acoustic space. This time I invited several of my favourite Oxford artists to come and record: Simon Batten, Evan McGregor, Phillipa Lacoski, Moogieman and, Matt Chanarin. Unlike last time, we brought a small audience to come and enjoy the real thing. 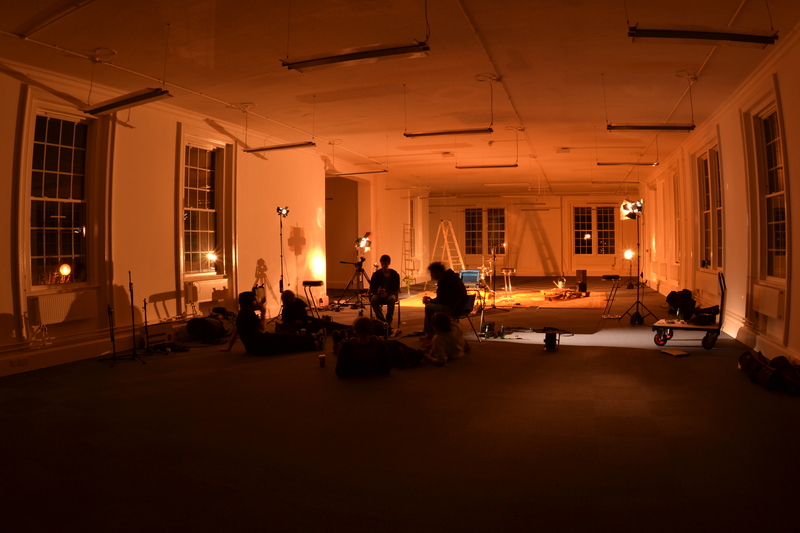 We all sat down in this empty room drinking tea, eating pizzas and quietly listening to live music! Needless to say, it had something nearly magical about it. I hope you enjoy the recordings and the music. There will be photos and videos soon! The video from last Sunday is finally finished. I hope you enjoy it. A special thanks to: Warren Dupuy and Jamie Williamson for filming and Warren Dupuy for editing. This is another track we recorded with Matt Chanarin last Sunday evening. What was most fun about recording in this big empty room at SAE Oxford was positioning microphones and musicians in order to obtain a correct ratio of direct to reverberant sound. Going through this process led me to think that I believe a lot of the magic of recording in beautiful or interesting acoustic spaces is slowly getting lost. Indeed nowadays it is trivial (at least to the user of the modelling softwares) to digitally reconstruct an acoustic space. This is why, when I am asked to talk/lecture potential SAE students during school visits, I end up walking around the building speaking at the top of my voice and getting them to listen to how my voice’s character changes from room to room. So I encourage any of you to at least experience an interesting acoustic space by clapping, singing, shouting, whistling or doing anything next time your in one! Listen out to how the room reacts to the impulse you give it. Yes. You’ll look stupid, but its great fun! After having had some sort of leaving party on the Saturday night, I thought it would be a good idea to go to work at 10am the next day and then record till very late in the evening. Now this might seem like the type of anecdote calling for a ‘seemed like a good idea at the time…’ but it wasn’t. It most certainly wasn’t. The above recording is just a snippet of the ambience. It was so enjoyable that we’re thinking of doing this again. The song was recorded using only two microphones and I don’t think it could have benefited from more. I have been a huge fan of Matt’s songs, ‘River Bank’ is now my favourite and I hope you’ll enjoy at least as much as I do. Most of the evening was filmed by Warren Dupuy and Jamie Williamson. A little video of the evening is in the process of being made. I had one those nights when you wake up very early in the morning and feel wide awake. I stayed in bed and had a bit of a think. Suddenly, it occurred to me there was a tremendous amount of sounds coming from outside – I usually sleep with the window open. It was 4am and the birds were out singing and I had a smile on my face. Then slowly the sounds, although remaining at a similar volume, changed of nature. By 5am all the birds had been replaced by cars and busses and the smile on my face had vanished. I closed the windows and fell asleep again. After a morning nap, I got up and noticed the noise was still there but louder. I got ready to go to work and hoped onto my bicycle. On one of the roads leading to my work place I crossed a fellow cyclist. He was wearing headphones and was listening to loud music. Normally, when I cross people doing so I go through an internalised ‘people’ rant: “That’s such a stupid behaviour! They can’t hear what’s going on a around them! that’s dangerous for them and for the others! and! why an earth do PEOPLE nowadays always want to live in their bubble, shutting themselves away from the rest of society! And that’s such a stupid an weird behaviour anyways! they can’t hear what the’re doin ect…”. If I had not witnessed the bird’s singing-sounds to city-noise transformation I would have probably forgotten about the rant and the cyclist only to have the same internal conversation another day. Now I think that the cyclist was just blocking off that constant background drone and I was its victim – needlessly putting me in a mildly angry mood. So I have come to the following conclusion: I-Pods and other music-playing-portable devices are the natural evolution of our response to increasingly noisy surroundings!? Anyways, I just think we need to be a bit more aware of our sonic surroundings as they greatly influence our moods and I don’t think blocking them off are the best solution. Maybe we should reduce how much travelling we do by car? Organise our transport systems so they are not audible nearly everywhere you go? Maybe you guys have other solutions to propose?? Have look at Julian Treasure’s talks on the subject on the TED website. Ps: You’ll notice I have added a section to thank the people supporting the project and have added a french translation to the ‘Project’ page. I’d like to begin by saying that I am pleased to announce that I have had support from RME and am now the proud owner of a Fireface 800. Photos will be coming soon! I have also upgraded to Pro-Tools 10 and now have a full recording setup running smoothly. I’m in the process of organising a recording session to test the setup with the wonderful Matt Chanarin please check out his music, its great. I have been following him round Oxford for a couple of years now – sounds like I’ve been stalking him… I haven’t. After having played with him, recorded with him and danced all the way through his gigs, I find myself knowing all the lyrics to his songs (at least the old ones) and singing along with him when I see him live. Unfortunately, he will not be in the country for my departure from Oxford, so this test recording is a perfect excuse to have him participate in the project. Ever since I had the idea of this project, I have been waking up feeling this trip is a long way away. Yesterday it struck me – I’m leaving in less than a month! I started to worry. It seems like I have an unfathomable amount of things to get ready. Every morning, there always appears to be something new that needs to be done: buying the last bits and pieces, following up emails, chasing up emails, promoting the project, finding people to record, taking care of Doppler, getting fit… Amongst all of this, questions and doubts start to form: is this going to work? is it all going to fit? where will I sleep? and most and foremost, where am I going? quite literally, where am I going!? However, while clearing up my room yesterday, I remembered going through all this stress before with projects I was now putting into cardboard boxes. Then I remembered my housemate, who’s currently writing up her PhD, going through the same panic only a few days ago. This made me realise that this sort of panic is probably inherent to every project. It’s necessary to keep your efforts going and focused! Although this may seem obvious to most of you, I thought I’d share these thoughts nonetheless. I have also decided to post more often as I need to practise my writing! (this is another thing I panicked about – my writing is terrible how can I make it interesting for people who are following the project!). Also, you will notice I have updated the website and there is now an ‘Artists’ section. This is where I will be listing everyone that I have recorded or, at this stage, will be recording.